COBOL stands for Common Business Oriented Language. It was developed by the US Department of Defense for business data processing needs. COBOL is applicable to write application programs useful for defense domain, insurance domain, etc. which require huge data processing make extensive use of COBOL. This tutorial is mainly targeted for software programmers who wish to seek the basics of COBOL. 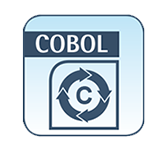 After completing this tutorial you will understand more about COBOL programming language. To learn this tutorial one must be familiar with basics of computer programming terminologies and JCL.